Rex Lee Jim is a former Vice president of the Navajo Nation, a poet, a playwright and Medicine Man. “Saad Lá Tah Hózhóón: A Collection of Diné Poetry” is available through Salina Bookshelf Inc.
Only 70 pages, there’s still much to unpack in Rex Lee Jim’s “Saad Lá Tah Hózhóón: A Collection of Diné Poetry.” From preservation of a vanishing culture underneath a dominant Western society to recollections of life on the Navajo Nation, Jim’s poetry speaks with numinous beauty. The poems originally appeared in the 1998 collection, “Duchas Taa Koo Diné: A Trilingual Poetry Collection in Navajo, Irish and English.” More than 20 years later, they are just as relevant, speaking earnestly of life as a Navajo under a Western shadow. That message of preserving Navajo culture and language is present not just in its themes, but also in the way the book is presented. Each poem features two versions, beginning with the original, unchanged from the Navajo language, followed by an English translation by Jim. Corey Begay’s wonderful and simply designed cover and graphics highlight this duality, presenting two worlds in gold and purple separated by a gradually fading blue line. Drawings and graphics of birds on the inside do not distract from the collection. Instead, they add to its ethereal nature. The collection also acknowledges the role of family, friends and children, how we are created and shaped by those around us. The laughter of children is another reoccurring motif, calling back to a time of innocence and playfulness. Jim explores this power in “Shiyázhi Bidlo Nahosilts’i’” (“A Child’s Laugh”). In Jim’s collection, the essence of who we are is larger than what we can see and feel. It is something that lives on forever in a song, a prayer or a memory. The ways in which the natural world and spiritual world coalesce bring the most strength to this collection. When Jim examines our relationship with the natural world, we realize that we are not simply living in and around it. Rather we are one, floating in its breeze and moving with its currents. With grounding truths and suspended imagery, the poems in “Saad Lá Tah Hózhóón” are both heartbreaking and transcending. 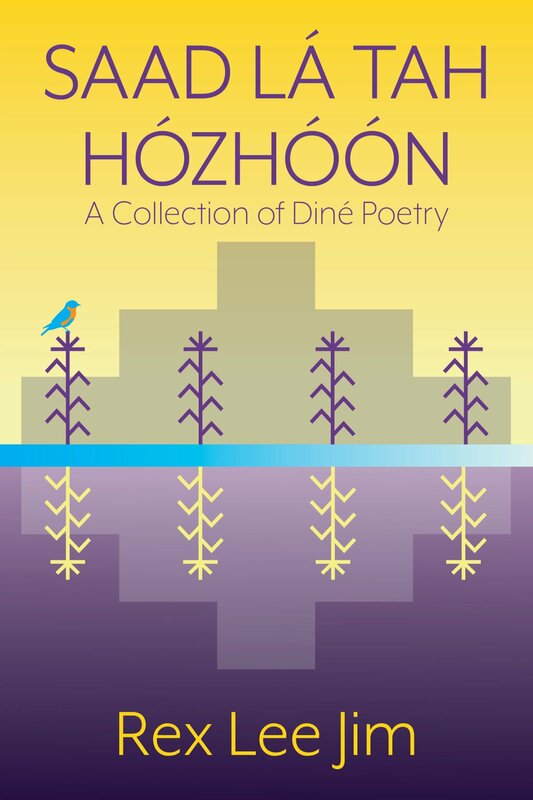 “Saad Lá Tah Hózhóón: A Collection of Diné Poetry” is available through Salina Bookshelf, Inc. Rex Lee Jim was born and raised in Rock Point, Arizona on the Navajo Nation Reservation. 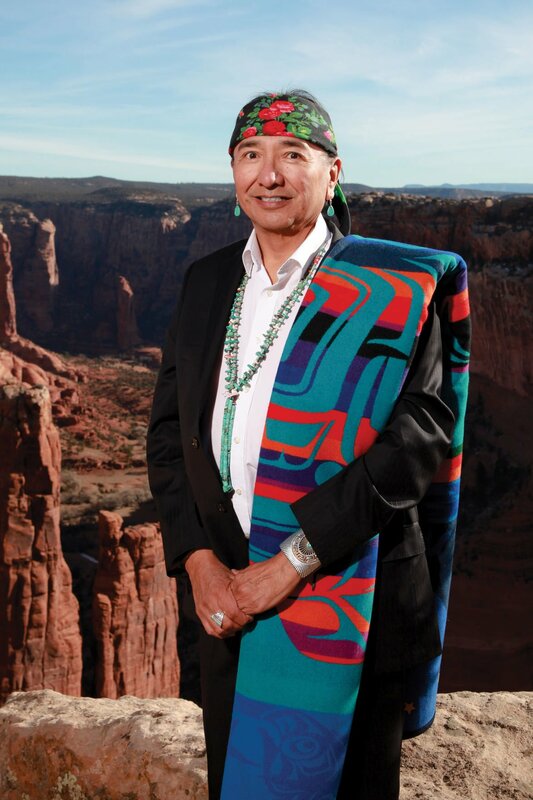 He is a former Vice president of the Navajo Nation, a poet, a playwright and Medicine Man.